Well-known automobile distributor Lawrence S. Ferguson, 20 San Gorgonio Drive, was called to the telephone today. A hoarse-voiced “Mr. Morris” declared that his auto had broken down five miles outside of town and that Lawrence’d better come quick. Apparently Lawrence always does as he’s told, because he hot-footed it out of town. But the hoarse-voice chap wasn’t five miles outside of town; he had instead hightailed it over to Lawrence Ferguson’s home. 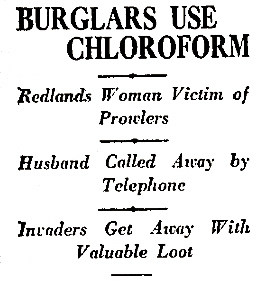 Hoarsey and a buddy paid a visit to the abandoned Mrs. Ferguson, where they stuffed a large wad of chloroform-soaked cotton in her mouth and nostrils, knocking her out and, according to authorities, did so nearly permanently, which would have added murder on top of robbery, and making prank phone calls. The robbery part, incidentally, netted the robbers three diamond rings worth $1,800 ($19,854 USD 2006) plus a silver saxophone, some jeweled wristwatches, overcoats, the money hidden in the mattress (how many times do we have to tell you people?) (and not in the Bible, either) and Mr. Ferguson’s revolver. And his Stradivarius, valued at $400 ($4,411 USD 2006).